Here are some very common mistakes that people often make when selecting an emergency plumber. Look them over and make sure you avoid making the same ones. Cheap plumbers sometimes offer services that aren’t on par with what you want for your home. The same goes for the flipside. If you have money to spend and opt simply for the most expensive plumber because you assume that expense means quality, you may find that to be false as well. Instead of hiring based on price, hire based on reviews and word-of-mouth. 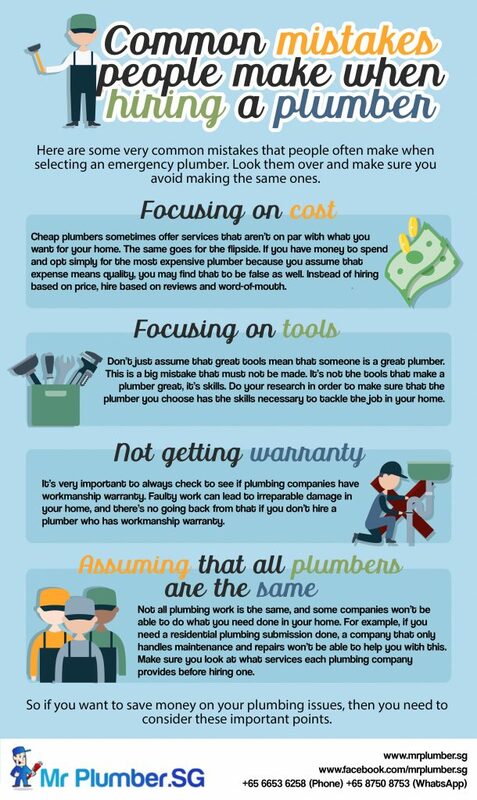 Don’t just assume that great tools mean that someone is a great plumber. This is a big mistake that must not be made. It’s not the tools that make a plumber great, it’s skills. Do your research in order to make sure that the plumber you choose has the skills necessary to tackle the job in your home. It’s very important to always check to see if plumbing companies have workmanship warranty. Faulty work can lead to irreparable damage in your home, and there’s no going back from that if you don’t hire a plumber who has workmanship warranty. Not all plumbing work is the same, and some companies won’t be able to do what you need done in your home. For example, if you need a residential plumbing submission done, a company that only handles maintenance and repairs won’t be able to help you with this. Make sure you look at what services each plumbing company provides before hiring one.